It’s been quite a year, this 2015. Hardest that’s come in my 33 years. Funny looking back on seasons once deemed difficult, now paling by comparison. Perhaps that’s an encouragement though – those valleys deep seeming shallow in rear view, after their hidden lessons were learned and the Author’s crafting, carrying, through it all made evident. Perhaps those rifts felt foreboding then as these canyon-sized cracks do now. Perhaps it’s just reflection’s rose-colored glasses. It’s been a year of dark storms and brilliant silver linings, a year of fears actualized and unknown strength rising. But let’s be honest – even that “strength” is simply weakness brought center stage, leading to greater dependence on the only One mighty. If in weakness one is strong, then I’m Miss Olympia. When walking sorrow’s road, there comes a point when our mortal core cannot carry gratitude’s banner any further, when the silver linings don’t make up for the massive clouds within, when you’re simply, honestly NOT OK and too weary to convince yourself otherwise. ‘Tis the way of all fallen flesh. Whether abandonment of provision, people, or plans, human hope only goes so far. Another exhausted day gave way to sleepless night. As the last of my frayed rope’s end gave way, the guttural cries stored deep from this awful year came pouring out, silent cries giving way to sobs. My life’s foundational belief in Yahweh, the One True God, the Ever-Faithful, Ever-Listening, Ever-Sovereign, Perfect Author of life itself, met its crux. All the silver-linings and gratitude-fueled-hope could not sustain the weight crushing within. God, I “know” You hear me but I NEED to know You’re with me, FOR me, RIGHT NOW in this make it or I’ll break moment. Would my Cornerstone prove sure? It all poured out with torrential force. Anger. Sorrow. Fear. Every awful emotion birthed from loss. Nothing polished. Raw. Laid out ugly before Holiness in the dark of night. Here, He showed Himself near. A middle-of-the-night message sent from a friend woken, prompted to pray for me, for my precious children. Slowly I heard His whispers. I’m here. Whispered nudges to a spent soul, Open your Bible app. A book of 66 books. Out of all of that, where do I even start?! Just open it. How can I repay the Lord for all the good He has done for me? I will take the cup of salvation and call on the name of Yahweh. I will fulfill my vows to the Lord in the presence of all His people. The death of His faithful ones is valuable in the Lord’s sight. Lord, I am indeed Your servant; I am Your servant, the son of Your female servant. You have loosened my bonds. I will offer You a sacrifice of thanksgiving and call on the name of Yahweh. I will fulfill my vows to the Lord in the presence of all His people, in the courts of the Lord’s house—within you, Jerusalem. Hallelujah! I read the psalm over and again, awed how the phrases contained spoke directly to my cries. It had just turned midnight. I opened the app again. A new day’s passage appeared. Peace like lightening broke through my dark. He heard me. God was speaking to me – broken, battered, ugly-raw me, saving me from what I couldn’t save myself. And His Words spoke Grace. 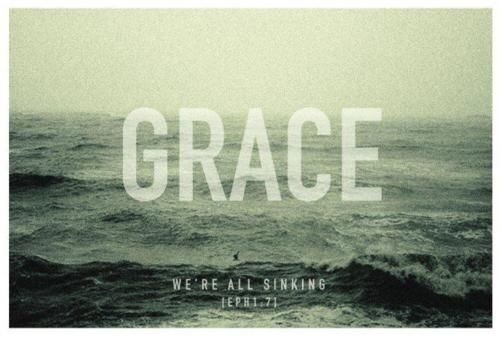 Grace greater than sin, ALL sin, mine, those against me and against those I love. Grace, My child. And with it – Hope. At the blackest bottom of my hole, God gently placed mine. Strength for today and bright hope for tomorrow. Beneath storm clouds still raging, He renewed truth’s song in me. When everything teeters on the brink of crumbling, how do you cope? You cry out to God, pray earnestly for His strong arm to mend the broken, to rescue before collapse. You search Scriptures, search your heart, search earnestly for something, anything, for remedy. But what do you do when after all this – the tears, the prayers, the repentance – it all falls anyways. Prayers for repair seemingly return with rubble. I’ve pondered this much of late: how to reconcile cries for fixing when the answer comes back in further breaking. Was the Lord averse to my cries? Had my pleas fallen on calloused ears? I am not a handyman. Oh the love of our patient God. As I wrestled with this new realization of my heart’s desires, He whispered again transforming truth. 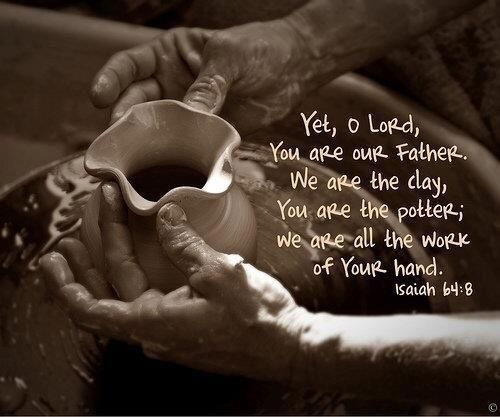 You are clay and I, the Potter. The Potter. Master craftsman. Clay always transforms into its destined design within the molding palm of His hands. Should cracks develop or walls weaken, He does not simply patch nor mend. The Potter presses the entire piece to the ground, flattening to scratch and building again from the bottom up. For the vessel to hold true, it must be made new. For the fractured, fixing requires breaking. With this newfound perspective, I realized my cries for fixing had in fact been answered! Not by mere patchwork that would eventually give way to greater rupture but by the loving leveling of the Master Potter’s Hands. Not out of distain or frustration but clear vision of the full potential trapped within the my clay, potential that could only be realized by His molding touch. He allowed all to fall so it could be built up in Him, strong and sure. Take heart, weary one. You are not forsaken. When it all falls down, rest your battered bones in the palm of your Potter. His desire exceeds mere repair of fractured places. Know you are ever in His sight as the apple of His eye. He has a masterpiece in mind! Therein lies the beauty of being broken.